Compulsory Basic Training (shortened to CBT) is a training course which must be completed by people wishing to ride a motorcycle, moped or scooter unaccompanied on the road. Unless you already have a full motorcycle licence we require that all new scheme members undertake Compulsory Basic Training before hiring one of our scooters. Where will I carry out my CBT? Wheels 2 Work Lincolnshire (Access Your future Ltd) is a fully approved training provider of CBT. All of the fully qualified trainers are friendly and experienced. You will carry out your Compulsory Basic Training at our site in West Ashby and on the roads in the surrounding area. CBT is completed within one session as part of your W2W Induction day. The induction day also includes a full scheme induction and interview. When you complete Compulsory Basic Training (CBT) to the required standard, you’ll get a certificate of completion – also called a DL196. How long is my CBT Certificate valid for? 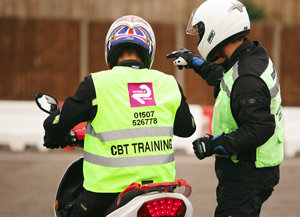 Your CBT certificate lets you ride a moped or a motorbike up to 125cc on the road with L plates for 2 years. After 2 years you must repeat your CBT to renew your certificate.